After an unplanned, life and motivation-centred hiatus, I’m going to try and get back to blogging our homebrewing exploits again. Hey, I’ve been busy brewing too… so, I guess that’s a decent excuse. I thought I’d just start with the most recent beer and see how we go from there, rather than take on the – frankly intimidating – task of catching up on all the brews I’ve missed out. This was the first brew on a new kit. It may not be the biggest, fanciest or shiniest kit on the block, but it’s an exciting step-up in volume for us. In one swoop, we’ve gone from a maximum brewlength of about 10 to more like 25 litres. More beer! Sounds great. It should also allow us to get more control over the brew, especially mash temperature. This was an ongoing problem for us with our old kit. For your delectation, here’s the upgrade. 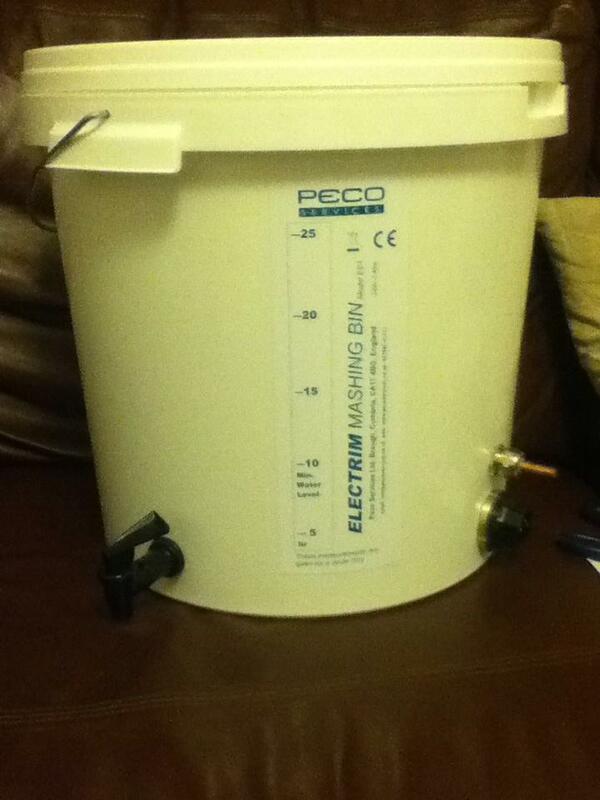 It’s an Electrim Digital Mashing Bin. So we’ll still be brewing in a bag and this will be used as both mash tun and boiler. This will allow us to reach and hold temperature much more easily and precisely. For this first brew, we played it safe and went for 20 litres of something pale and not too hoppy. It was an also opportunity to use up an ’emergency’ pack of US-05 that Kev had in the fridge. It was getting old and couldn’t comfortably have managed much more that 20 litres at this gravity. Definite positives and negatives to this beer for me. On the plus side, using really fresh Citra has clearly proved a winner. It’s wonderfully fruity, with a hint of something a little dark and suspicious… just how I think Citra should be. Hopstand technique working well again. Very much lacking in body and bitterness, though, and am struggling to disentangle the two a little. Less bitterness is fine… much as I’m very happy with ruinously bitter beer, not everyone is and maybe this will be a positive for others. Or, maybe the hopping schedule of just 60m plus hopstand has left it lacking a little something that some hops in the boil can help with. Will be interested to hear what others make of it. Definitely too light a body, though. It was mashed at 67c (according to the new digital display), so will try mashing higher on future brews, especially relatively low gravity ones. Think we might also need to start experimenting with caramalts for future attempts at the style. And it’s under carbed. Again! Was looking to prime to 2.5 volumes, but it doesn’t really feel like it. Hoping the colder weather means it’s just taking it’s time and it’ll get there in the end. Anyway, bottles will be tasted by others soon, will post any comments here. This entry was posted in Uncategorized and tagged APA, BIAB, Citra, homebrew, Magnum, US-05 on March 27, 2015 by bagboilbeer. That’s an interesting mash tun. Never seen one like it – is it plastic? It looks like some of the plastic fermenting buckets I use. You are doing some pretty cool recipes by the way – nice work! Hi. Thanks for the comment. Yeah, it’s the Electrim Mashing Bin… basically a 35l plastic FV that’s fitted with an electric element which is thermostat controlled. BIAB so we mash and boil in it (while doing a 10 min dunk/sparge in a separate FV). Really helping with keeping mash temp up and gets a decent rolling boil. Pretty cheap and happy with it for now. Cheers!